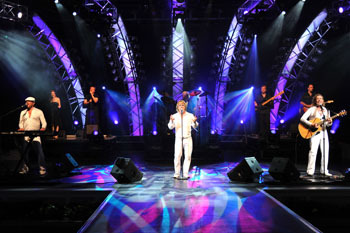 Saturday, October 19, 2013 | 7:00 p.m. to 1:00 a.m.
As an ode to the disco era, Stayin’ Alive Canada, “the world’s number one Bee Gees tribute band,” will transport guests back to the iconic age of disco. Gala-goers will keep the dance floor packed when The Company Men, “America’s first Mashup group,” perform the best dance classics combined with the newest hits! This “Modern Day Rat Pack” has quickly become America’s hottest “guy” group, interweaving hits from multiple genres such as Motown, rock, pop and today’s Top 40 – appealing to all generations. A lavish dinner, silent auction and 3-item live auction are additional highlights of this black tie evening planned by longtime Stehlin friends and event producers, Ward & Ames. Proceeds from The Friends of the Stehlin Foundation Gala will support research related to drug development for clinical trials; DSRCT, an insidious form of sarcoma cancer affecting children and young adults; and the Foundation’s Scholarship Program for students pursuing careers in the health profession at UST and other prominent colleges and universities.